Midland Mosaics in Tacoma, Washington is a truly unique experience. 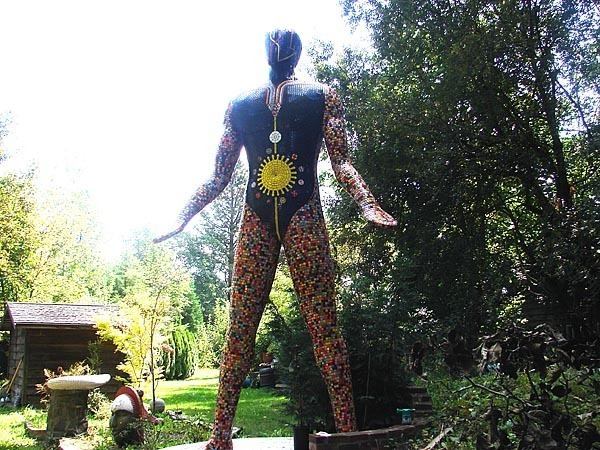 The attraction contains several "Backyard Giants" that are huge mosaic sculptures. This is about as unique and noteworthy as an attraction can be. All of the sculptures were made by one individual. The basic materials used to make every sculpture were steel, concrete, and tile. The name of the sculptor is John Lewis, however John does not like to give tours, and he seldom answers questions regarding the sculptures. So, when visiting, don't expect and indepth fact based tour. You'll feel more like a trespasser in someone's backyard. However, this is an excellent attraction, and anyone nearby should make sure to visit at least once. Hours by permissions, so ask when you arrive. Last updated by Chris on 20 May, 2012 in Destinations. Should always check out your own area, usually plenty of cool stuff around! I have lived in Midland for 30 years and never heard of this place, so now this is a must do thing. I have traveled the world from Russia to Tahiti and China to South America....but not my own back yard. Thank you for sharing! Don of BCI Properties behind McDonalds on Portland Ave..., just a few blocks up the street. Nice. Hope you like the post on the 'Enchanted Highway' I put up today then! If the picture is any indication of the kind of things you'd see there than I am ready to check it out. Really cool. You're welcome. There's much more like this coming up. I love offbeat stuff like this. Thanks for the suggestion, Chris!